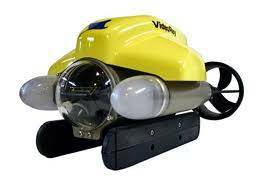 VideoRay is the largest volume producer of Underwater ROVs (Remotely Operated Vehicles) in the world. Established in 1999, VideoRay has worked with technology and mission partners throughout the world to develop and prove the small ROV tool for a wide range of applications. With over 2,500 units delivered to a wide range of organizations for a wide range of missions, hundreds of VideoRays work every day throughout the world underwater keeping us free from terrorism, finding and retrieving objects, inspecting infrastructure both inland and offshore, and keeping divers safe from hazardous conditions. We pride ourselves on state-of-the-art customer support and easily operated and maintained underwater robotic systems. The VideoRay Explorer ROV Systems have been configured for ROV users who require more functionality than the Scout ROV systems but still have a limited budget. The VideoRay Explorer ROV systems add a higher resolution, 160° tilt color camera, water depth readout, auto depth feature, compass heading readout, and run time meter with the same 76 meter (250 feet) depth rating that the Scout carries. Explorer ROV systems lack the ability to attach any of the accessories compatible with the Pro 3 and Pro 4 systems. VideoRay Explorer ROV systems are typically reserved for simple interior inspections in a calm underwater environment and for public museum and educational displays. A step up from the base Explorer ROV to the Explorer X3 ROV would include a Tether Deployment System (TDS), an excellent option for quick coiling and recoiling of the tether. The Laser Scaler attachment for the VideoRay Pro 4 ROV systems is a plug and play measurement device that can be attached or removed from the vehicle in seconds. The laser accessory projects two vertical “fan” beams precisely 7.5 cm (3 in) apart for scaling, estimating, or measuring applications. The "fan" nature of the laser beams fills the entire field of view of the ROV camera so that no tilting mechanism is necessary. The laser scaler can be used with existing VideoRay accessories such as the manipulator arm and sonar systems. This attachment is compatible with VideoRay Pro 4 ROVs only.